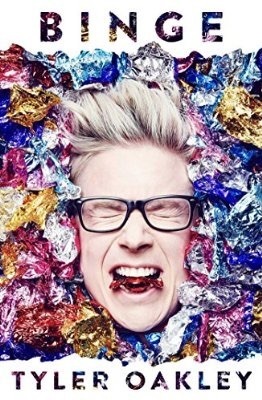 Before reading his book, Binge, I wasn't very familiar with Tyler Oakley. I've seen him hosting some awards show red carpet coverage and a few of his YouTube videos, but I'd never pretend to be one of his fans. That being said, I couldn't help but be curious about Oakley. He took a YouTube channel and turned it into a brand that has earned him a comfortable career and celebrity status. The book compiles Oakley's musings about life, love, and the random things that have made him such a fascinating character. He mixes serious sections such as one about being in a physically and emotionally abusive relationship with funny recollections about the hotness of Disney princes and the culinary wonders of Cheesecake Factory. Reading his candid recollections reveal the reason for his success. He has an undeniable charisma that makes him seem like a close friend. Tyler has capitalized on his affable personality by turning himself into a recognizable brand. But broadcasting his life to the world has not come without a personal cost. In one of the more terrifying sections, he writes about being bombarded by fans at a YouTube convention. The event happened to fall on his birthday, and the large group of fans only wanted to send Tyler their well wishes. Despite the positive intentions, a large throng of people rushing the vehicle and yelling his name startled the young star and left him contemplating a retreat from the public eye. This entry was posted on Monday, August 29, 2016 and is filed under Binge,Book Review,Memoir,Tyler Oakley. You can follow any responses to this entry through the RSS 2.0. You can leave a response.